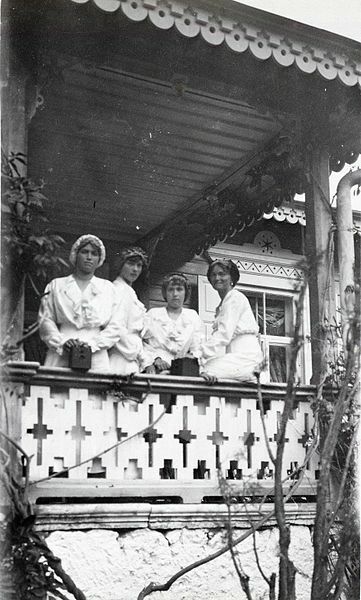 The Romanov sisters, circa 1914. Image courtesy of the Beinecke Rare Book and Manuscript Library, Yale University, via Wikimedia Commons. The problem with taking history courses is that you never quite learn enough. You get to know essential historical events and why they’re important, but due to time constraints, there isn’t much about the people who lived through those events. Who were those children and adults? What made them smile? What did they do for fun? What did they deem important, and what did they ignore? What are their personal stories? I’m presently reading Helen Rappaport’s book, The Romanov Sisters: The Lost Lives of The Daughters of Nicholas and Alexandra. I spotted it recently and decided to pick it up so I could find out more about Grand Duchesses Olga, Tatiana, Maria and Anastasia. To me, they and their brother Alexei have always been shadowy figures, pitiably caught up in historical events beyond their control and executed for just that reason. The book does a lot to change my images of them. It describes them as the Princess Dianas of their era, some of the most photographed and discussed young royals at the turn of the century. They seem to have been pleasant and beautiful young women, living a lifestyle that the rest of us merely dream about. They were well tutored and smart, fluent in several languages other than Russian, and even playful and irreverent at times. Helen Rappaport has used letters, diaries and other sources which bring the Romanov sisters to greater life since it’s their own words or the words of their contemporaries speaking for them. She doesn’t talk much about the tragic end of the Romanov sisters — that’s another book Helen Rappaport has written — but it’s been covered in other books and even movies and miniseries as well. The execution scene in each one is chilling, no matter who produces it or acts it. On the day of their execution, Olga was 22. Tatiana was 21. Maria was 19. Anastasia was 17. Alexei was 13. I sometimes muse about what would have happened to the Romanov sisters and their brother if they had received the help they needed to escape from Russia and had lived to be senior citizens. Would they have lived to ripe old ages, remembering the glories and tragedies of their childhoods? Would they have dedicated their lives to creating awareness of different causes, like Princess Diana? Would they have married well and lived aristocratic lives somewhere in quiet solitude? We’ll never know. That will be a mystery, forever.